As I approached the school where I was to do a storytelling gig last week, I noted that the school's marquee was featuring the character program trait for October, Individuality. This book came to mind and it occurred to me that this is a perfect book to share that message. 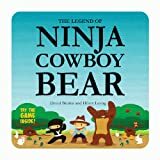 The Ninja, the Cowboy and the Bear are good friends but they argue and face off against each other in a series of contests. Each one has a strength or ability, unique to them. Bear can build the tallest pile of rocks. Cowboy is sharp eyed and can gather the most berries, Ninja's quickness allows him to herd the most rabbits. They come to appreciate each other's abilities which are unique to them. A game of Ninja, Cowboy, Bear, which is played like Rock, Paper, Scissors, is described at the back of the book. This game is a whole body workout. The illustrations distinguish this story. Hilary Leung's simple but winsome characters bring Japanese chibi designs to mind. The books is also sized to rest comfortably in a child's lap. Lots of nice subject headings can be tagged to this book, Friendship--Fiction, Individuality--Fiction, Competition--Fiction.